I wanted to put together a blog post to let you know about the book ‘Swallow This’ By Joanna Blythman. 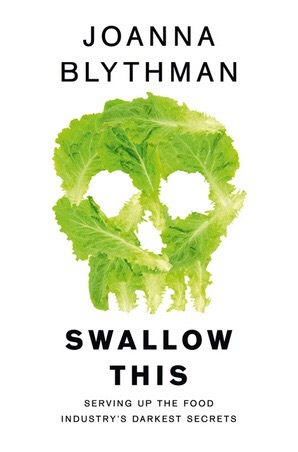 I started reading this book around three weeks ago and it has really changed my outlook on food. This book is the inside scoop on what really goes into our food. All the hard to pronounce chemicals that we see on our ingredients lists but cant even pronounce are demystified in this tell all book. I am usually a huge junk food fan, snacking on crisps and chocolate to give me energy and relying on Coffee to get me through the day but this book changed my perspective of food. Instead of looking at what I ate as a whole I have started to look at my meals (and snacks) as the sum of their parts (including their chemical & manufacturing processes) and many foods I have found myself not wanting to eat because now I know what is in them. I had no idea that store bought sandwiches and vegetables are packed in gas contained packaging to stop the decomposition process so they last that few days longer. So I decided to try eating foods that are less processed. Over the years I have swapped back & forth between eating meat and being vegetarian. I always seem to go back to being vegetarian because I end up not really enjoying meat all that much, so I decided to cut out meat because I don’t really miss it anyway. The first action I have taken is to sign up to a weekly Organic Vegetable box. I decided to go with Abel & Cole (www.abelandcole.co.uk). They had an introductory offer in which you get first Box for half Price and then your Fourth box also half price (Plus a free bottle of organic Prossecco). I will be taking delivery of my fourth Box on Friday! I really like Abel & Cole because they allow you to change the contents of your box weekly and remove items that you won’t use. Each week is different and all the vegetables are organic and seasonal. I order the Large Very Veg box, which is usually around £26.00 a week. This contains 8 packs of vegetables. A mixture of Veg, salad and root vegetables. The day before my box is delivered I search for recipes online for fun things to cook, I print off the recipes and buy any other ingredients I may need, then I am ready to cook as soon as my box has arrived. I used to cook quite a bit but never from scratch. I always bought store bought, ready to cook potatoes and bagged veg but having all these fresh vegetables that are organic and full of nutrients has inspired me to cook every day. I have used my veg box contents as the main focus of my meals. Home made Tomato & Red Pepper salsa & Guacamole. What’s more, I have had so much fun doing it too! I would Highly recommend this book to everyone who is interested in knowing what they are really eating and You should check out the various Organic boxes of Meat, Fruit & Vegetables by Abel & Cole too! The last three weeks have been extremely eventful for kitties in our household. We have two adult cats Lucifer, a 3-year-old male cat and Bailey a 7year old female (both Neutered & both Black). Lucifer is our fur baby and Bailey belongs to my sister (who is currently staying with us). We decided to add to our brood and get a kitten. I have always wanted a Ginger kitten called pumpkin and so we began the search. We called every feline charity in the area (Lancashire) and even further afield but there were no ginger kittens in any of the charities. So we decided to look at private sales and again, there were no ginger kittens in the area at all. We finally found a ten-week-old female in Leicester so my Boyfriends daughter and I drove over to collect her. On arrival she was so tiny, but she also had a brother there that was considerably bigger than her so we just figured she was the runt of the litter so we took her home. A few days later a trip to the vets revealed that she was a 6-week-old Male. He shouldn’t have left his mother yet, but he was healthy and we were told to fatten him up as he was on the skinny side. Three weeks on and pumpkin is settled in perfectly. He has grown considerably and has just had his first injection. He’s extremely playful (much to Lucifers annoyance) and loves to curl up for cuddles. He’s the perfect addition to our feline family! I’m a Happy little Planner! I have always struggled to be organized. It always seemed like so much hard work, which often leads to me missing appointments and not recording vital information. So throughout December last year, I decided to start a bullet journal which was all well and good but I’m not very good at art and so it looked like a five year old had done it. In my journal searches I kept seeing these pictures and videos of these beautifully decorated Planners from America and they always looked like so much fun. I found out that these planners were available on Amazon in the UK and so I ordered myself one. I opted for the Classic Happy Planner by Mambi365 – They are pretty expensive (Around £35.00) but is a large planner, which is great because it leaves plenty of room for my work and Personal planning. I soon realized that there is a whole planning world out there, with so many shops offering beautifully crafted weekly sticker kits for your planner. Etsy is now my favourite website in the whole world, there are so many stickers and decorative kits on there that you never have to have the same weekly look twice. There is literally a sticker out there for whatever you need to record from filling up your car with petrol to planning a blog. It has really helped me organise myself and keep track of all my appointments. Below are just some of the themes that I have put together in my planner. This is a great way to get creative even though you may not be all that artistic. I find it extremely relaxing to play around with all the stickers and make it personal to your needs. Are you a planner? Which planner do you currently use? Let me know below. 2016 – A year in Books! How are we all? I hope you all had a great Christmas and New Year! I thought that I would do my usual new year post and list the books that I read throughout 2016! At the beginning of 2016 I went to www.goodreads.com and took part in their reading challenge. This is where you set a reading goal for yourself as to how many books you would like to read throughout the year. I set a goal of 40 books and ended up reading 42! So here is a list of the books I read and their genre, as well as a rating out of 5! As is quite apparent, I was very much into ghost stories this year and I found some really great authors (Darcy Coates & Shani Struthers) that I will definitely like to read more of. What was your favourite Author in 2016? What book couldn’t you put down?